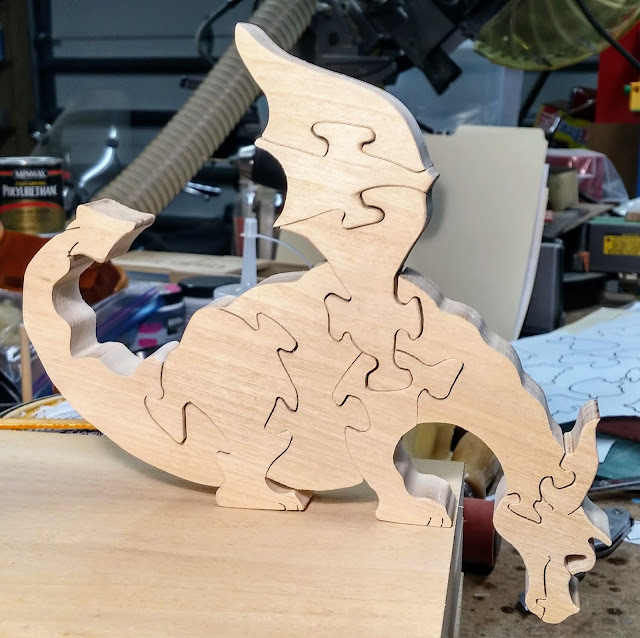 I made a few of these yesterday from a pattern that was published in Scroll Saw Woodworking & Crafts magazine. I've got a bit of a soft spot for dragons and my grandson loves them. When I saw this one I knew I had to make some. They are made from poplar 1x6 and just barely fit. The first one I cut with a #5 reverse blade. It worked OK but the cuts were fuzzy aka woolly. I've seen this described but never encountered it. For the second one I switched to a #3 double cut and got a very smooth cut almost glossy in places. However, I don't think I'm going to be doing any stack cutting with these blades. They cut on both the up and down stroke and they are a bit harder to control in the tighter turns. I used my sanding mop for the first time on an actual project. It's going to take some getting used to but it cleans up the fuzzies and gently rounds the edges as advertised. I was skeptical of this when I first got it because it would eat up the pieces of pine 2x4 I was using to break it in. More on sanding mop later.